One year ago today in North America, Eden Games took what was once a mobile game, and made it into a console port, just for the Nintendo Switch and next month, they’re releasing its sequel! In typical interview fashion, would you be so kind as to introduce yourself to our readers, tell us a bit about yourself and your involvement with Gear.Club Unlimited 2? Yannick Berthier: Of course! I’m Yannick Berthier and I’ve worked on the Gear.Club games since the beginning, in 2014, as a narrative, gameplay and system designer. I was recently appointed as lead designer at Eden Games. Miketendo64: For our readers who don’t follow the series, would you mind explaining just what exactly kind of a game Gear.Club Unlimited 2 is and what is the second instalment about? Yannick Berthier: Gear.Club Unlimited 2 is a racing simulation game that puts players behind the wheel of top supercars, which can be modified in a fully customizable workshop – the Performance Shop. In this sequel, players must rebuild their father’s team by becoming the World Series champion! They will also encounter many other situations in some 25 hours of optional content included in the game. Miketendo64: How does Gear.Club Unlimited 2 differ from the first game? Yannick Berthier: We listened to what players had to say and aimed to create a far more realistic game. There is more subtlety, detail and individuality in the way the cars behave. Our car designers and engine programmers greatly improved our physics simulation in order to create sensations that would have been impossible in the first Gear.Club game. Miketendo64: A couple of complaints Gear.Club Unlimited received, was a poor selection of cars, “weak AI,” freezing, and a variety of bugs. Whilst developing Gear.Club Unlimited 2, have you done anything differently to tackle this issues before they can become an actual problem to those who play the game? Yannick Berthier: We saw this feedback and responded by adding nearly 20 new cars, in order to offer a more varied driving experience. Our AIs have been improved and players will now have “rivals”, or tougher opponents, to face over the course of several competitions. Regarding the bugs and freezes, many of them disappeared when we worked with our new track creation system. Miketendo64: The original Gear.Club Unlimited, features a range of 32 luxury cars, how many cars are in Gear.Club Unlimited 2? Any new additions you’re particularly proud of? Yannick Berthier: We have worked very hard and there are now more than 50 cars available, including the Fenyr SuperSport made by Lykan, which is a monster in terms of power. Personally, I love the Porsche 918. I enjoy driving this car the most. It’s easy to get to grips with, but offers huge drift potential. It also has great acceleration and offers fantastic driving sensations! Miketendo64: While Gear.Club Unlimited, actually started off as a game developed for mobile devices and christened ultimate when ported to Switch, Gear.Club Unlimited 2 is being developed exclusively for the Nintendo Switch. How are you finding the process? Yannick Berthier: To be honest, releasing the first Gear.Club Unlimited on the Switch was a leap into the unknown. We didn’t know if players would like our more motorsport-oriented approach to racing, on a console that is more used to playing cartoon/arcade-style games. Their feedback was fantastic, however, which encouraged us to continue down this path. We therefore, decided to concentrate exclusively on this platform to get the most out of it and give Switch players the most advanced experience possible. Miketendo64: Being as though you only released Gear.Club Unlimited 1 last year, what prompted you to develop a second instalment, instead of supporting the first game with paid DLC? Yannick Berthier: The first game was our first experience with the console. It was an opportunity to see if players liked our work and were willing to follow us in this more realistic direction. When we saw that they were, we decided not to go down the DLC route and focus instead on a new and far more ambitious game than the first in terms of the render and sensations. Miketendo64: Given the fact one year has passed since Gear.Club Unlimited launched on Switch, has there been anything you have learned during developing the first game, in which you were able to use this time around and elaborate upon? Yannick Berthier: We now have two years of experience on this console and you can feel it in the render. The production stage was longer, giving us more time to overhaul our graphics engine. Now we can have 12 opponents in huge environments with the best possible resolution. It’s a great achievement. Miketendo64: Did you use vehicle models and assets from the first game or did you start everything again from scratch? Yannick Berthier: We completely redesigned all of the environments using our new graphics engine, which offers far greater realism. The cars benefit from this improvement too. Miketendo64: Given the fact that Gear.Club Unlimited 1 was developed with Unity, I’m assuming the same can be said about Gear.Club Unlimited 2. What is it like using Unity to develop for Switch compared to other platforms? Yannick Berthier: Yes, Unity is still our render engine. Their tools work very well and have constantly improved over the years. It is thanks to the latest versions of this engine that we’ve been able to achieve this level of quality for the graphics. Miketendo64: One of the fun things to do in Gear.Club Unlimited 1, is to take advantage of customizing and upgrading your vehicles. How would you describe the variety of changes in Gear.Club Unlimited 2 available to the player, compared to the first game? Yannick Berthier: While overhauling the graphics we also added a comprehensive sticker editor. Players will now be able to totally change the look of their vehicles. The Performance Shop can be endlessly improved and customized and is easier to navigate. Miketendo64: With Gear.Club Unlimited 2 being a Nintendo Switch exclusive, is there any chance the game actually allows the players to decorate their cars with cool Switch Logos? Miketendo64: Did you ever consider chatting to Nintendo to see if you would be allowed to use Nintendo related decals, or Nintendo themed cars like those seen in Rocket League? Yannick Berthier: That’s not yet possible either. Maybe one day, who knows? Miketendo64: The race tracks in the first game were considered reasonably short compared to other racing games on consoles. To be fair, it was a port of a mobile game so the tracks were designed to be played in a short amount of time. Now that Gear.Club Unlimited 2 is developed for Switch, will race tracks be longer for prolonged play? Yannick Berthier: I think the players will be delighted to see that we listened to them and to discover the 1800 miles of roads available in Gear.Club Unlimited 2! We have new environments, new game modes and more competitive championships. Miketendo64: Since Gear.Club Unlimited offered various environments over a course of 400 races, just how many races and new environments can we expect this time around? Yannick Berthier: Drivers can access more than 1000 challenges in Gear.Club Unlimited 2 (more than 300 in solo mode and about 700 in multiplayer leagues), which take place in four varied environments, namely Dream Bay, Giants Valley, Glaciers and Dead Rivers. Miketendo64: Are there any plans to support Gear.Club Unlimited 2 with DLC post-launch? Yannick Berthier: We’re currently focusing on the patches in order to ensure the best possible experience for our players as soon as it is released. Miketendo64: What is your favourite thing about developing games like Gear.Club Unlimited 2 and are there any particular racing games, which you haven’t developed, but are fond of? Yannick Berthier: The most exciting thing is managing to recreate the feeling of risk and speed that drivers experience in real life. We feel like we’ve given real control to our players when we get to the point that a player squeezes past an opponent on a bend in one of our cars and thinks “phew, just made it!”. We must have one of the biggest collections of racing games around in our studio. We are big fans of Forza Horizon and Project Cars. We are constantly striving to bring this experience to Nintendo players. Miketendo64: Although you have more than 20 years in the business of making racing games, what would you say are the difficulties and hardships you face when developing games like Gear.Club Unlimited 2? Does it get easier or is it still a case of every new game brings with it plenty of new challenges? Yannick Berthier: It’s always a challenge! We need to keep on improving our technology and adapting to new platforms and new audiences. The games we make now are very different from what we used to make in the 90s, in terms of production, tools and gameplay. The main advantages of having so much experience are that we’ve had time to develop very advanced expertise in the area of physics simulation and we’ve been used to working on multiple platforms for a long time. This makes our team very resilient in the face of change and enables us to provide so much content in our games. Miketendo64: Thank you greatly for your time and your answers are very much appreciated. But, one last question before we let you go, is there anything you would like to say to our readers and those you feel will enjoy Gear.Club Unlimited 2? Yannick Berthier: Thanks to you and the readers for your interest in our game. 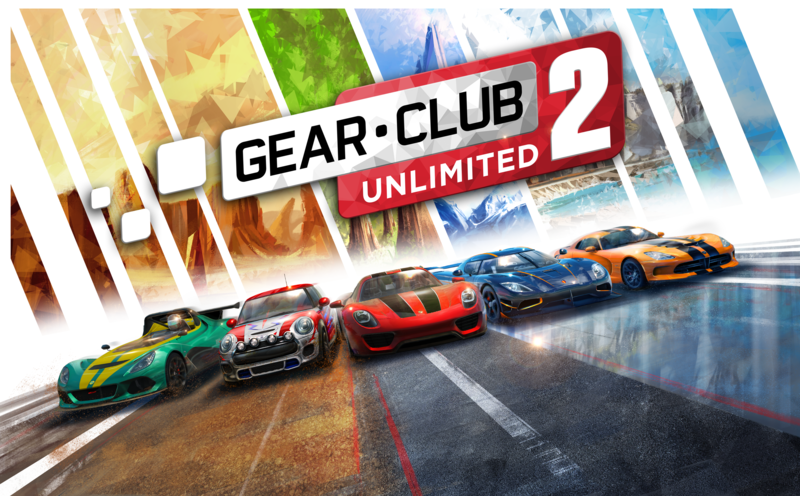 We look forward to meeting you on the race tracks in Gear.Club Unlimited 2 online! The Miketendo64 team would like to extend our personal thanks and gratitude to Yannick Berthier, for finding the time to answer our many questions. We can’t wait to check out the sequel on launch day!